1. To undertake a detailed study on the legal financial and consequences on reviewing the National Pension System and to submit suggestions. 2. To examine how does the review process affects the terms and conditions of Central Finance Commission and the Fiscal consolidation perspectives. 3. To undertake a detailed study on the liabilities and responsibilities occur based on the agreement executed with NPS Trust and NSDL and to suggest the possibilities. a) How the contribution remitted by the employees till date will be handled? b) Whether the Government contribution remitted so far get reimbursed? To examine the above and submit proposal. 5. 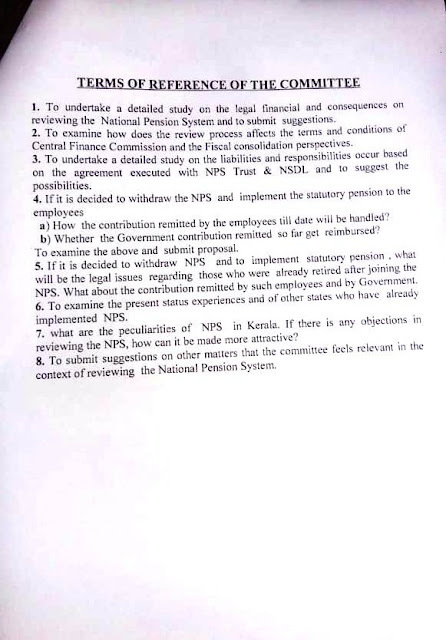 If it is decided to withdraw NPS and to implement statutory pension, what will be the legal issues regarding those who were already retired after joining the will be the legal issues the contribution remitted by such employees and by Government. 6. To examine the present status experiences and of other states who have already implemented NPS. 7. What are the peculiarities of NPS in Kerala. If there is any objections in reviewing the NPS, how can it be made more attractive? 8. 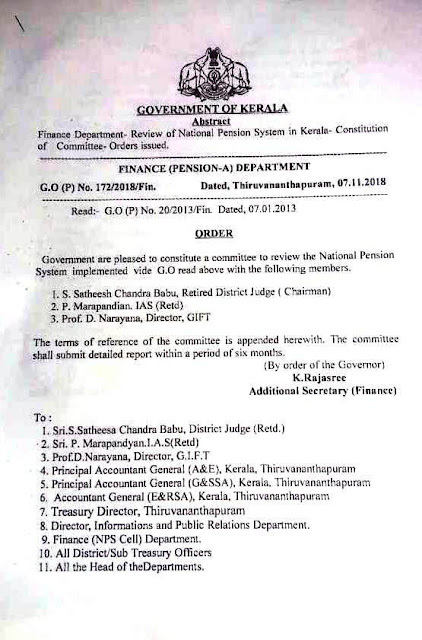 To submit suggestions on other matters that the committee feels relevant in the context of reviewing the National Pension System.